Friday night pizzas have been a long time tradition for my family. And the funny thing is regardless if anyone is even going to be around to eat the pizza, I continue to come home from work and prepare one! It’s so routine for me, as a relaxing finale to my work week. With a glass of wine in hand and my dough has been prepared the day before; my pizza comes together within an hour. It will be there for my son at any time and leftover slices for lunch over the weekend. My son is strictly a meat lover; pepperoni or sausage and frowns and picks off anything other than that! I, of course, love to experiment and make different types. While I grew up on the Sicilian thick pizza which my mother made in large rectangular baking sheets, I prefer a thinner crust pizza. Grilled pizzas are a summer favorite I adore having that extra crispy grilled crust! But mostly my oven does its magic, using a pizza stone at times, or simply this fantastic pizza screen which is basically a mesh surface that has little barrier for heat, like using nothing at all so the pizza cooks faster than in a pan. This veggie topping of roasted cauliflower is first slightly roasted in the oven to soften the cauliflower and then finish roasting on the pizza. I’ve added in pancetta at times and varied the final topping of fresh herbs from parsley to sage to rosemary. It’s not an overly cheese pizza, the pine nuts and bread crumbs add a tang and crunch to the pizza. For a bit of spice, I like to add in crushed red pepper or a drizzle of hot sauce; but that’s just me and my spicy habit. Preheat oven to 425 degrees. Place the cauliflower florets on a large baking sheet, drizzle over the oil and salt and pepper. Place the garlic halves cut side down on the sheet. Roast for 25 minutes, until lightly browned and soft but still crisp as the cauliflower will continue to roast when baking the pizza. Meanwhile, in a small bowl, combine the bread crumbs, oregano, parmesan cheese and olive oil mixing together well. To make the pizza, layer the pizza dough with the Fontina or Mozzarella cheese, then the cauliflower florets. Squeeze the roasted garlic bulbs around the pizza and top with the bread crumb mixture. Place in oven and roast until golden brown approximately 10-17 minutes depending on the heat of the oven. Remove from oven and sprinkle on fresh herbs. Using a stand up mixer with dough attachment, dissolve yeast and sugar in the warm water. Yeast should begin to foam which means it is “alive”. Should the yeast not begin to foam, toss and begin again as the yeast is not “alive” to proof. (Make sure the temperature of the water is also not too hot or too cold as this will affect the yeast as well.) Mix in 2 cups of flour, salt and olive oil. Knead with the dough attachment for about 5 minutes while slowly adding in the remaining one cup of flour. Mix for another few minutes as the dough becomes smooth and elastic. Remove the dough from the mixer and form into a ball with your hands on a floured surface. Coat with oil and place in a large bowl. Cover and let rise until doubled, about 2 hours. If using quick rise yeast, the dough will rise in about 1 hour. At this point, I normally place the dough in the refrigerator overnight and bring out the next day to rise for 2 hours. I find that the texture is better when refrigerated overnight as well as finding it easier making pizzas when I prepare the dough ahead of time. Preheat oven to 425 – 450 degrees. If using a pizza peel to slide the pizza into a baking stone, place the baking stone on the bottom rack now to heat at least 15 minutes. When dough has risen, punch down and let dough rest 10 minutes. Flatten dough and gently stretching and pulling into shape. If dough is resistant, wait 5 minutes and begin again. If using a pizza peel, lightly dust the peel with semolina or cornmeal and place the pizza on the peel. If not using a peel, place pizza on a lightly oiled pizza pan or pizza screen. Brush edges with oil and sprinkle with cornmeal (optional). Add toppings. Place in oven and bake for approximately 10-17 minutes – depending on the heat of your oven and thickness of your pizza. Remove and allow to cool at least 5 minutes before cutting. * When making 2 pizzas, I increase the flour to 4 cups, the water to 1 ½ cups, salt to 1 ½ teaspoons and olive oil to 2 ½ tablespoons. I do not increase the sugar. After the dough has risen, divide the dough into two and proceed as above. I love these toppings. (Katherine’s not big on cauliflower, but I enjoy it.) Friday night pizza and wine is such a great tradition. Has your bf ever had his cauliflower roasted? I know it’s changed many of my friends opinion of cauliflower! In fact, any veggie roasted just tastes better! Only recently have I started roasting cauliflower and I really do enjoy it. The idea of putting some on a veggie pizza sounds wonderful! Like your son, I love a meat pizza but, every now and again, I’ll devote half of the pie to veggies only. Next time I do, roasted cauliflower will be included, thanks to you. Whenever I’m roasting one thing, I through in something else – garlic, veggies, an eggplant for dip…multi-tasking in my oven! Wow this looks amazing! I love meat but much prefer veggies on my pizza. Would never have thought of putting roasted cauliflower on top – what a fantastic idea. Aw, my mom used to do pizza Fridays too! I miss that–no family traditions when you’re living on your own. Okay, okay, I COULD make myself pizza, but that’s not nearly as much fun as mom pizza! Love the idea to top it with cauliflower, I looove cauliflower! Actually I really do miss having my kids around for these dinner nights, it would be so much more fun! anything that uses cauliflower is a winner with me, its such an underused vegetable. Looks delicious. Yum! This sounds and looks so tasty right now in these chilly temperatures! 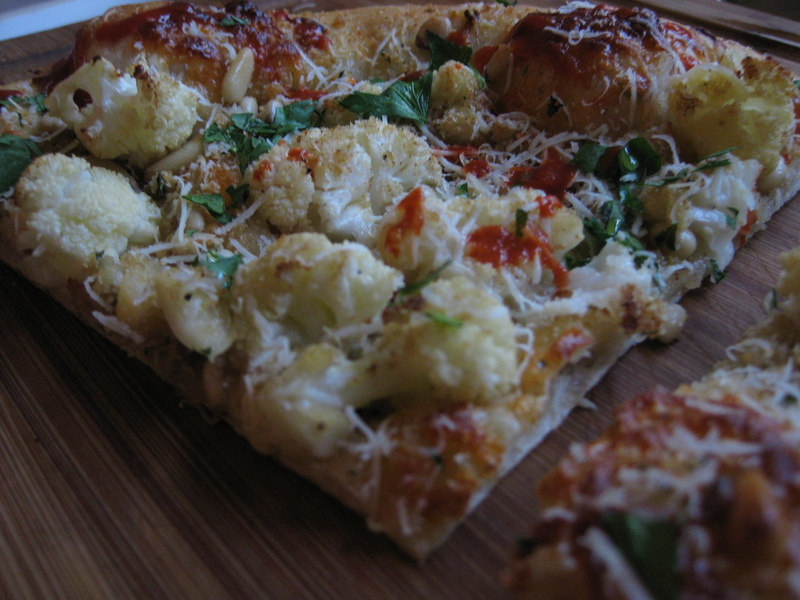 I love veggie pizzas…my favorites..The idea of putting roasted cauliflower on pizza is just wonderful and different!! Pine nuts just give a very classy touch!! Bravissima! Thank you! I’ve waited over a year to post pizza; I just don’t know why when I make it weekly! Contrary to many people I love cauliflower and I love the way you paired them with bread crumbs. Thanks for the pizza screen tip! I have never heard about it. We started doing roasted cauliflower last year, and fell in love with it…Never would have thought of putting it on a pizza, how cool! This looks wonderful. I love cauliflower! Did you change something? The header? I like it! Yes, you’re not seeing things! I keep playing around with the header…not sure what I like!! 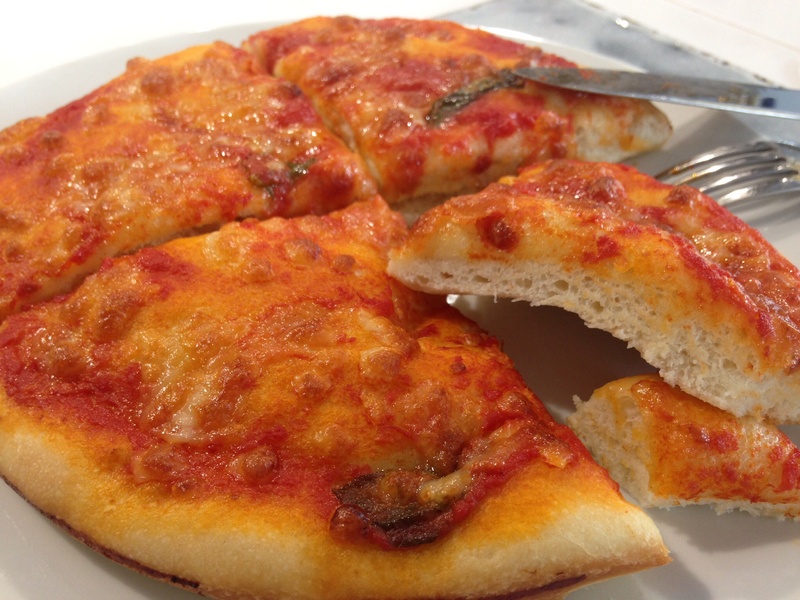 great looking pizza and I love the combination of ingredients! Why have I never thought of this combination Linda?! You are a genius. I hope you know that. 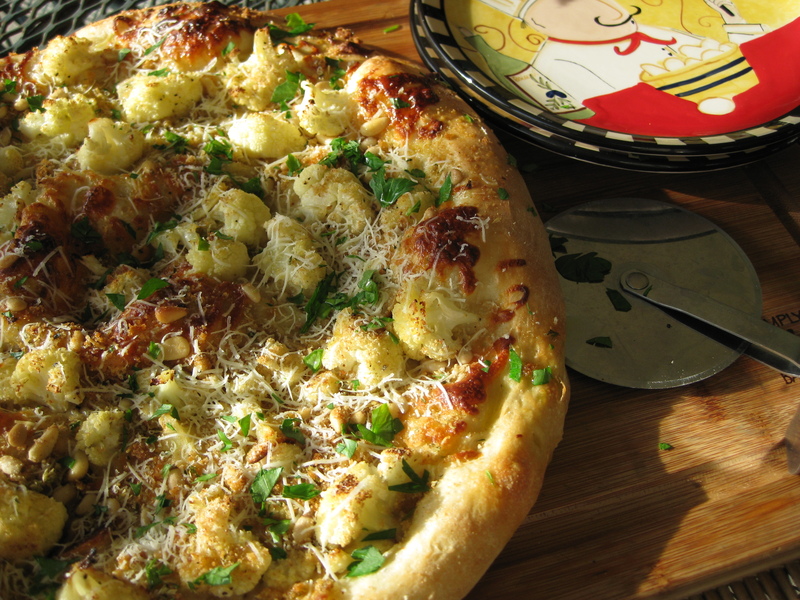 Roasted cauliflower is so yummy and I can’t think of a better way to top my pizza. BTW…I am totally addicted to the eggplant and fontina sandwiches you posted awhile back. I have been bringing a couple to work everyday this week and am not tired of them yet! I’m so glad you enjoy them! I too happily bring in the leftover to work! They are great warm or cold! Our minds seem to be aligned with each other when it comes to what we are cooking. You were talking about meatloaf and I did a post. I cooked my Sicilian pasta with roasted cauliflower today and you made a pizza with roasted cauliflower. The pizza sounds great! 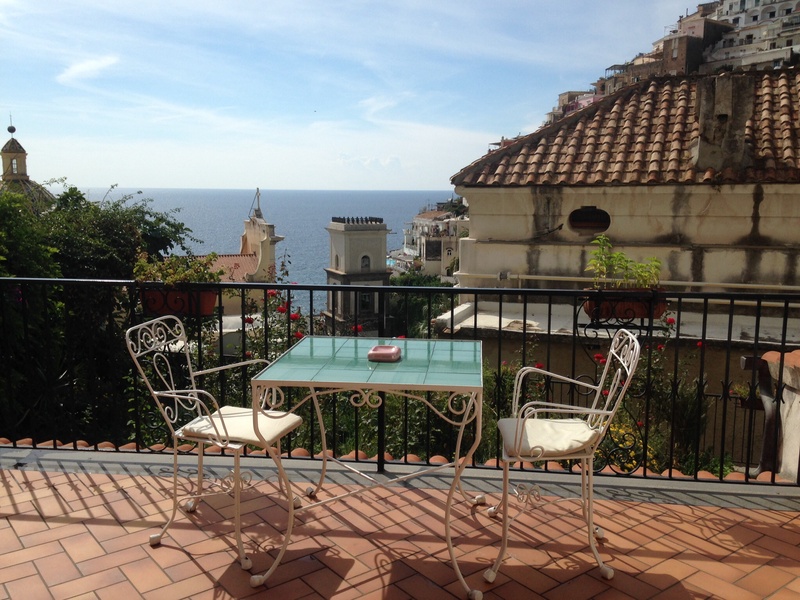 Mmmm….with pasta sounds delicious too! I love that you put cauliflower on your pizza – I think that rocks! roasted cauliflower is a delight and combined here with garlic and pine nuts… wow, each bite must deliver some pretty wonderful texture and flavour. Love the lighting in your first shot. We always had pizza on Friday nights when I was growing up too! Such great memories you gave me as I was reading this. I need to do that with my kiddos too. 🙂 I’m not sure if I’d like the cauliflower, but I’d certainly be willing to try. I’m a big fan of garlic and pine nuts. Now I’m hungry again…LOL! 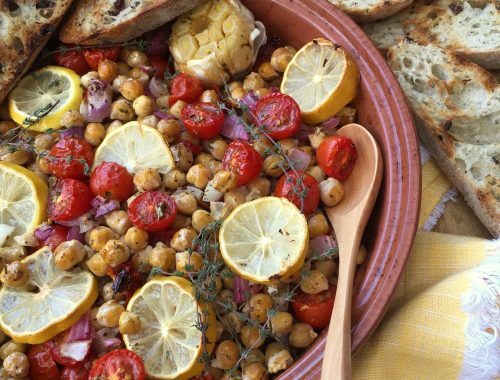 What a great use of cauliflower! We love cauliflower but do get bored with it every now and again – this certainly take the boring out of it! Looks fabulous! I love cauliflower! I can honestly say I have never heard of cauliflower on a pizza before. Now I’m wondering why – looks absolutely great. This looks fabulous. I’ve got to subscribe. I’ll tuck it away for when cauliflower and romanesco start rolling in in the cooler months. I’ve never roasted cauliflowers but I have to say it’s one of my favorite veggies, and it’s so rare to find good recipes. I am really surprised to see it on pizza! I MUST try this! What an AMAZING pizza! I love the flavor combination and so creative! That’s a new one…wild combination. I’d love to try that. Italian Fried Dough, YUM! This definitely brings back childhood memories at my Grandma’s home when her house doors were open all dy long. She worked hard for this during the 2 times in the year and how long of a preparations for them, too. Love them Italian recipes so keep them coming and I will share with my friends as well.